The NYPD has received information that members of MS-13 are looking to hit' police officers who live in certain parts of Long Island to enhance their credibility within the gang, The Post has learned. In a memo released Tuesday, authorities from the police departments 105th Precinct warned officers that the department has received threats against [members of service] who live in Brentwood and Central Islip, both hamlets in the Suffolk County town of Islip, as well as Patchogue. The memo goes on to explain that police officers should always be cognizant and alert, should change their routine, keep an eye out for any strange vehicles and, if they do see anything unusual, make note of it. The violent gang, which started on the West Coast and has ties to Central America, has been expanding its brutal activities in New York City recently and has been coming into more frequent contact with the NYPD. The most shocking eruption of MS-13-related violence came early this month when a man was shot to death on a No. 7 train platform in Queens by a group of the gangs members. "Just killing the Police that Americans can't be bothered to kill...."
The only American thing that scum should be contributing to is the local morgue. No prob. NYC sanctuary city. The NYPD need rules of engagement that put this ms13 scum down. Is this the same intelligence that warned years ago not to flash your headlights at vehicles driving dark? That such vehicles were new gang members needing a teardrop tat? They need to talk to Chuck and Nancy and have them dial their protection racket back a scoosh. This is what happens when you invite illegals to your city. The main MS-13 problem is on Long Island,especially Suffolk County,not in NYPD territory. I know of the slippery slope and all but my feeling is still just kill them or are we just going to wait on them becoming contributing members of society? The problem isn’t IN NYC-——reading the article helps. MS-13 killers should be sought on a capture dead-or-alive basis. So illegal immigration only starts to be a problem when they threaten to kill government employees? Nice to know the order of importance of people. I see. New York is immune since MS-13 is only targeting Long Island. 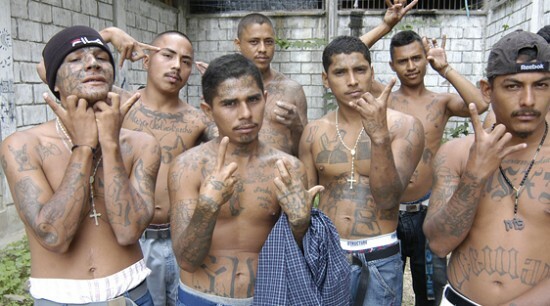 How about an OPEN SEASON on anyone with MS-13 tattoos. No bag limit, no license needed, no caliber restrictions. Maybe we should consider removing illegal aliens BEFORE they harm of kill Americans. We don’t have to wait. That’s enough to remove them.